Karrie on Canvas: Acrylic Painting Demo - "Have Fun with Cats!" Below is another full episode of the show “Karrie on Canvas” starring artist Karrie Evenson. I am a big fan of this show. I love Karries carefree and colorful approach to painting. Sometimes it is nice to just let go and paint something without much thought or careful planning, especially after a hard day. It is extremely relaxing and therapeutic. In this episode, Karrie will demonstrate how she paints one of her abstract paintings, specifically of a cat. Here is how Karrie approached this painting. She first created an abstract drawing on a separate piece of paper using a technique known as a “continuous line drawing”. This is where you create the entire sketch using one continuous line. She then copies her sketch onto her canvas using charcoal. She then sprays it with a fixative so that the drawing will not smear. She then tones the canvas. After that is all complete, she begins her painting. Watch the video episode below to see the finished product! 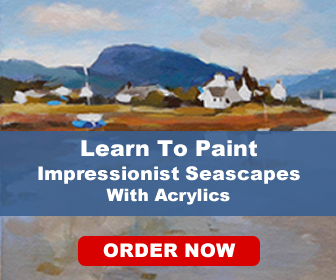 Enjoy this acrylic painting demo! A big thanks to the folks over at Jones Television for sharing this video. You can see more of their great programming over at their YouTube Channel Here. If you would like to learn more about Karrie and view more of her work, please visit her Website by following this link. Karrie on Canvas: Acrylic Painting Lesson - "Jazz it Up!" Dear Karrie, wow, thanks for your demo, re the cat and bird. I am a beginner painter, senior citizen, I thought I had to have everything perfect like the real things. How encouraging! Coming back to painting after 40 years. never used acrylics before, so Karrie is making it exciting and freeing!